The departement of the Alpes Maritimes - Pop. 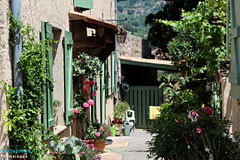 : 7,500 h.
41 km from Nice and 22 km from Cannes. 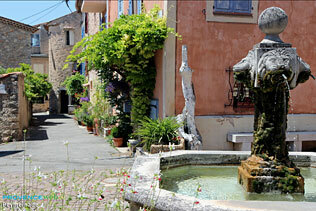 From Nice, take the National Highway 85 to Grasse, then follow the RD2562. Peymeinade is a relatively recent municipality - it was only created in 1868, when it broke away from the municipality of Cabris. 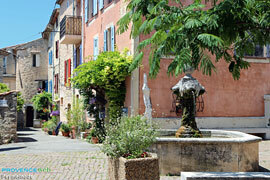 Today Peymeinade is a small peaceful town, which has undergone considerable post-war expansion - as shown by the modern hamlet of Saint-Marc - to such an extent that it has become the second shopping town after Grasse. 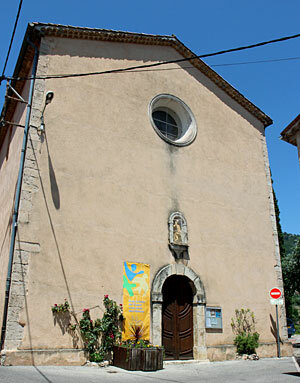 The oldest part of the village comprises some pretty 18th century houses grouped around the church, a beautiful round 19th century fountain adorned with lions' heads, and even a library with a ceiling painted in 1882 by the "Compagnons du Tour de France" craft guilds. Pastel house fronts with blue or light green shutters, dressed stone archways, Roman tiles in shades of brown, oleanders and lavender in pots ... you're definitely in the south of France. In this Mediterranean natural environment - olive trees, flower cultivation and market gardening - the inhabitants of Peymeinade live peacefully, very close to Grasse and just 20 km from the coast. It's the ideal spot for families looking for a country life but near the shops... or for top level researchers, who might find work in the nearby high energy molecular physics laboratory. St Roch church (18th century). Chapels and oratories. Visits to the Grasse perfume factories. Lac Saint Cassien - Caves of Saint Cézaire and Saint Vallier, November to February. Hiking. Tennis. Fishing. Swimming pool. Car rally. Olive tree festival (July). Antiques Fair (July). Car rally (May). International professional cyclists' "Grand prix" (February). Open air musical and theatrical events (August). Spéracedes (3km), Le Tignet (5km), Cabris (7km), Saint Cézaire Sur Siagne (9km).